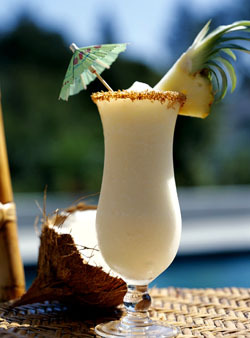 Piña Colada – Old-style recipe for this popular drink. The coconut cream needs to have the right consistancy, some find the alternative, coconut milk to be too thin, however you can add condensed milk to coconut milk to bring up it’s thickness. Add pineapple juice if desired. Put all ingredients into an electric blender with 2 cups of crushed ice. Blend at a high speed for a short length of time. Strain into a collins glass and serve with a straw.